Use the 'Collaborative Evaluation' checkbox on the Create Evaluation Form page to create a shared set of evaluation forms to allow multiple evaluators to edit the shared evaluation form. Only one author is allowed in a collaborative evaluation. In addition, there is no tracking to identify the evaluator who is saving the comments. Data entered into the form by the evaluators is inserted into the one author's record. Note: The evaluation report will only show the "Author" and not the collaborative "Evaluators". In addition, the evaluation report does not flag the evaluation as having used a collaborative form. Select the 'Collaborative Evaluation' checkbox (under2 - Assign Evaluators & Schedule). A warning message displays with important information regarding collaborative evaluations. Note: Only the Author name appears when using the advanced author editing (clicking theAuthor Settingsbutton). The collaborative evaluators are not shown in this view. Note: Denying the Author submission rights will also deny all the collaborators from submission. Evaluators using the collaborative form will click the 'Evaluate' button, to edit and view the collaborative form. 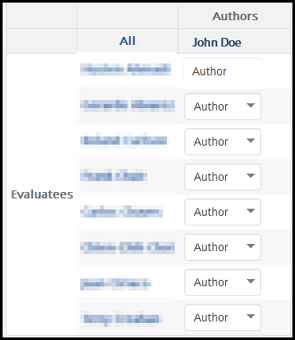 The collaborative evaluators can see the "Author" name after clicking the "Evaluate" button (on the dialog that displays).